You have decided that you want to have an indoor fireplace in your home. The inviting gathering place and secondary source of heat are two great reasons to own one. However, as you search for the right one, you may think, which prefab fireplace should I get? There are so many different types of fireplaces that it can almost feel overwhelming. At eFireplaceStore.com, we offer all types of fireplaces to fit all applications, large and small, simple or grand. We organize all available models into categories by unit type, giving an easy jumping off point to begin your search for the perfect fireplace online. Not sure what fireplace fireplace to purchase? Check out the Fireplace Buyer's Guide below written by one of our NFI certified fireplace specialists. How much chimney pipe do I need for my fireplace? Due to the many differences between fireplace brands and types, there is no set minimum distance that can be referenced across the board. Many direct vent appliances require a minimum of 6 inches of horizontal vent or 2 to 3 feet of vertical vent. Wood burning fireplaces typically call for 15 feet of venting, which is measured from the base of the fireplace to the top of the chimney termination. There is also the 10/3/2 rule that pertains to wood burning fireplaces. The rule states that the chimney must extend 3 feet above the roof penetration on the upward side of the pipe, and the top of the chimney must be 2 feet higher than any portion of the building structure within 10 feet. Depending on your roof slope, this could make for as little as 3 feet of chimney above the roof or as much as 15 feet or more. When in doubt, we highly recommend contacting our NFI certified technicians to discuss your installation further. Another resource is our chimney pipe quote form. This form allows you to share all aspects of your installation, providing the details needed for our specialists to generate a thorough quote. Who should I work with to install a fireplace? Ideally, it is recommended to work with an NFI certified professional to install your new hearth appliance, however such installers can be difficult to locate in certain areas. The installation of a hearth appliance is often part of a larger project and many contractors have a solid understanding of this type of installation. It is our utmost priority to ensure that thorough technical support is available during the installation process. Any of our NFI certified technicians will be happy to guide you and can be reached at 1-800-203-1642. Likewise, we will be happy to work with your selected contractor to achieve your end goal. Whether you are working with a contractor and want to understand the installation process or plan on handling installation yourself, our fireplace installation guide will provide a solid basis for you to work from. Do I have to use a bathroom approved fireplace in a bathroom? A fireplace will indeed need to be approved for use in a bathroom. Please compare the advantages and disadvantages of the Empire Carol Rose and the Napoleon linear fireplace (48" propane). The biggest advantage the Napoleon 48" Galaxy unit has over the Carol Rose series is the multi-colored LED light strip effects. The Napoleon unit also offers an optional log set, which is not available with the Carol Rose models. Due to the number of obstacles that are involved with overseas shipments, it is currently not our policy to provide this service. However, we are happy to work with a third party freight forwarding company. In these cases, we will provide the same free shipping for orders over $99 to the lower 48 states. The shipment will be sent to a freight forwarding location of your selection, with the assigned booking number attached for a smooth transfer from the freight carrier to the freight forwarder. From there, freight costs will be the customer's responsibility. It is important to note that while we can facilitate this process, it will be up to the customer to verify code compliance within the destination country, as well as taxes levied on incoming shipments. I want to add a fireplace to our family room that is capable of burning wood and propane. My desire is to have a propane fired unit that could be converted to a wood burning unit if for some reason we were unable to get propane (natural disaster, etc.). Would it need to be zero clearance, and on an outside wall. Room is only 15' x 15' with 8' ceilings, so probably we would only need a medium (36"?) sized unit. Also, the fireplace would be used as a supplemental heat source so efficiency is a consideration. What makes and models are available? The only option will be to install a prefabricated wood burning fireplace have a locally-licensed plumber run a gas pipe stub into the opening. The pipe stub could remain capped until you installed a vented natural gas log set, but please note that this configuration would not provide any efficient or measurable heat and you would not be able to alternate between fuel types. Due to the design of any hearth system that is dependent on natural draft for combustion, too much heat will be lost up the chimney to provide efficient heating. Subsequently, the efficiency will be roughly 10% with the configuration you are requesting. If you are looking to provide supplemental heat, I recommend considering a EPA Certified Zero Clearance Fireplace, but these systems cannot be installed with any type of gas line, so you will only be able to burn wood. What is the difference between an insert and a regular fireplace? 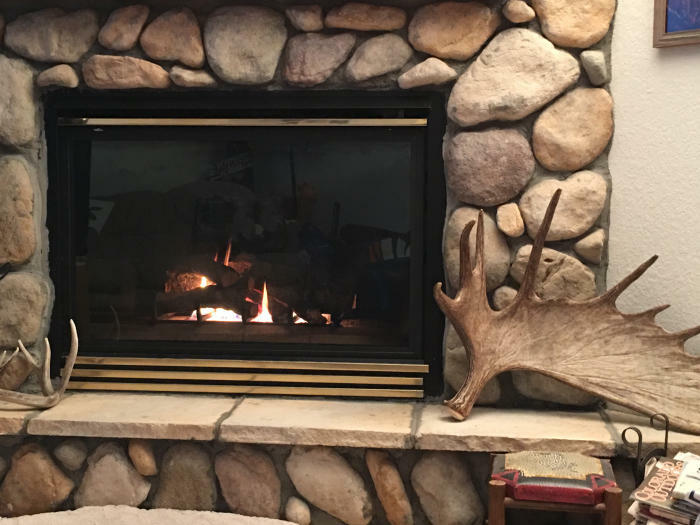 A fireplace insert is a hearth system that is manufactured to be installed into the opening of an existing masonry or prefabricated wood burning fireplace. This differs from regular fireplaces, which can be installed with wood framing. Do I have to use a stainless steel firebox on an outside patio even if it is under a roof? Yes, due to the moisture in the outside air, we recommend a stainless steel firebox for such an application. Otherwise, a standard firebox will eventually fall victim to rust and corrosion. What are advantages/disadvantages of vent versus vent free? I can do either but vented straight back is preferred. If possible, using a vented unit is preferable. The only disadvantage to a vented unit is the slight decrease in overall efficiency when compared to vent free. However, they do not effect indoor air quality and do not introduce excess moisture into the room. Vent free units offer more versatility and greater efficiency, but many customers report being able to smell them while operating and they can add too much moisture to the room when operating for extended periods. They are also known to cause oxygen depletion issues in very tight homes. Have you had a long-running dream of adding a fireplace to your home? If so, you aren't alone. Fireplaces have always featured heavily in the idea of a cozy and comfortable home. However many find themselves not attempting to install a fireplace in their home due to a lack of knowledge when it comes to choosing the perfect fireplace. The variety of types and styles do make it difficult to narrow down to a smaller selection of options for your home. This article will discuss the different types of fireplaces available and will provide you with all the information you need to purchase a fireplace with confidence. Fireplaces appeal to almost everyone. However, if your home has a modern feel, you may feel that a fireplace isn't right for your decor. Or, perhaps you feel that your active lifestyle keeps you from having time to properly enjoy one of these relaxing additions? Luckily, fireplaces can be incorporated into any design style. The days of only having a traditional log fireplace are long gone. Now, everyone can experience the comfort, warmth, and beauty of a fire. Holiday gatherings and family events are a time when many find themselves looking for the warmth and comfort of a fireplace. Over time, families have taken to gathering around the fireplace to enjoy one another's company, and this has become a tradition for many. Curling up with a good book and reading by the fire is also a common well-loved pastime. The comfort of a dancing fire is so widely loved that even streaming services offer channels of fireplaces for those without one, but nothing compares to the real thing. The appeal of a fireplace is easy to see. It isn't expensive and gives a homeowner so many great benefits. Plus, with the newer safety measures and technology incorporated into fireplaces, they have never been safer. Be sure to do individual searches online for your city or by checking in with your local code authority or fire department to fully be prepared in having your fireplace up to code and as safe as possible. Always work with a certified fireplace safety inspector to ensure your fireplace meets every requirement necessary to pass coding and safety standards. This is a question only you can answer, and it's one you should know the answer to at the beginning of your search for a fireplace. Fireplaces can add to your home in several ways. It's important to decide early whether your primary usage will be for the ambiance, beauty, and mood setting abilities they provide or the heat and warmth they can add to your home. Every fireplace is different, so knowing exactly what you want for your home will reduce the number of possibilities significantly, resulting in a much easier search for finding the best fireplace possible. Setting expectations at the start of the buying process will prevent unnecessary frustration later on. An important thing to remember before purchasing a fireplace for any home is knowing the difference between a true fireplace and a fireplace insert. If your home has a masonry fireplace already installed that you are simply wanting to modify for better efficiency, then a fireplace insert is what you need. If you are planning an entirely new, updated look for your entire fireplace area, then choosing a full fireplace is your answer. Valor — Valor is a pioneer in both direct vent and power vent gas fireplaces. They consistently produce high-quality gas hearth products that are considered some of the most innovative on the market today. By blending modern design with the traditional accents' consumers love, Valor has the ability to offer fireplaces for almost any application. Heatilator — Heatilator has over 90 years of experience in the production of heat circulating fireplaces. They are credited as the first to bring truly zero-clearance fireplaces to the market. Their brand name is so well known, many circulating fireplaces are referred to as Heatilators, regardless of which brand they actually are. This company offers a wide range of wood, gas, and electric models and continue their proud legacy of quality manufacturing. Napoleon — Founded in 1976 as a steel fabrication business, Napoleon became a well-known name in the fireplace industry in 1981 when they created the first single pane ceramic glass stove door. 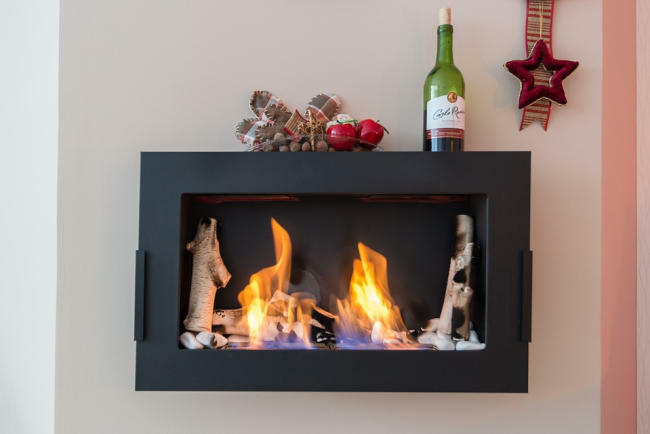 Since that pioneering moment, the company has naturally progressed into the manufacturing of fabricated fireplaces where they have introduced innovative log designs and some of the leading manufacturing techniques in the industry. They have now diversified into a much broader product line offering everything from builder models to show-stopping linear units. Fireplace Xtrordinair — One of the most customizable brands in the industry, Fireplace X is a brand of Travis industries that provides a luxury line of fireplaces with an astounding number of models and options to choose from. Each of these models is built to a high standard that many find difficult to compete with. Empire Comfort — Originally opening as a family owned sheet metal shop in 1911, Empire has been producing quality gas-fired hearth products for decades. Empire offers a broad line of value-based and high-level products. Over the years they have earned a reputation for simplicity, ease of use, and longevity. A wood fireplace is the traditional fireplace. There are several benefits to a wood burning fireplace, but wood fireplaces do have disadvantages as well. One of the most significant benefits is the fuel itself. You can buy the fuel in the off season, allowing you to stockpile the fuel when it is at its cheapest. Your choice of wood can also have an effect on the burn time, heat output, and even the scent of your fire. The disadvantages of a wood fireplace are mostly in the labor required to use them. A wood fireplace must be tended regularly while burning, nor can a burn be initiated in them without having cleaned the fireplace of surplus ash that has built up between burns. Wood must be carried inside from the woodpile, and the fireplace must be loaded carefully to prevent burning logs from rolling out. A level of caution must also be exercised during operation of wood fireplaces. Hot ashes or embers can be a hazard if not properly contained. It is also important to remember that wood burning fireplaces must be adequately maintained. Annual maintenance may keep you from incurring a higher home insurance cost. Additionally, local code enforcement may regulate these types of fireplaces. It is up to the homeowner to ensure the intended installation will be compliant with local regulations. Gas has quickly become one of the more popular options when it comes to having a fireplace installed in your home. One of the biggest reasons why is the advantages it offers homeowners. Below we will briefly talk about the two most common types of gas fireplaces and the advantages and disadvantages of both. More information can be found in our Gas Fireplace and Stove Buying Guide. Liquid Propane — Propane is usually the go to option for those who aren't on municipality utility lines for natural gas. 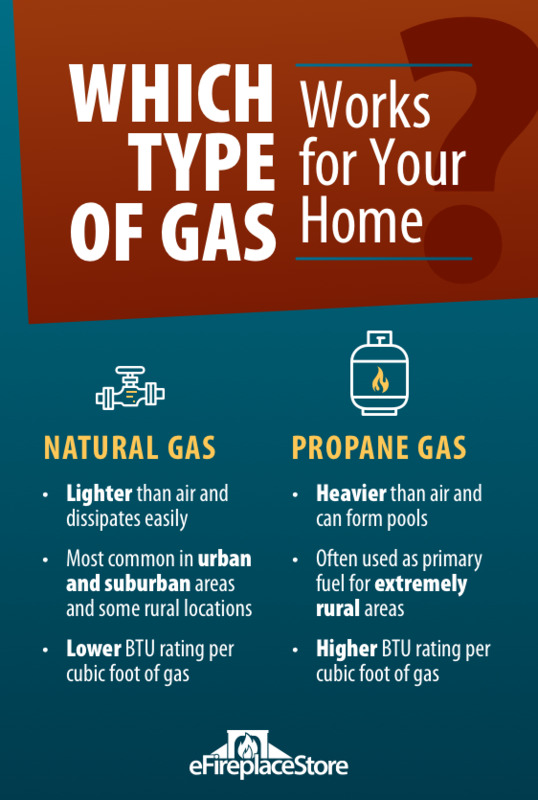 In some cases, homeowners may find that they already have a propane tank on their property. This is especially true if the home already uses other types of propane-powered appliances and a truck delivers the gas. It is also important to remember that propane is heavier than air and can form dangerous pools of gas. As such, it is important to install propane fireplaces per manufacturer instructions to prevent this danger. Natural Gas — Although in a slow decline, natural gas is still the most popular gas fuel in America for heating. This is because many government municipalities use this type of fuel. The advantages of natural gas are many, including easy hearth cleaning because of the lack of soot. Most natural gas fireplaces don't require electricity, so using your fireplace when the power goes out can be extremely efficient in the winter months. This is especially beneficial for older folks and families with young children. Unlike with propane, natural gas is lighter than air which avoids the dangerous pooling of gas that occurs with liquid propane. Electric fireplaces are possibly the easiest hearth appliance to have installed in a home. These additions are great when a homeowner doesn't wish to do a remodel of their home to add the look they are hoping for. With several types of electric fireplaces available, there are even options to have them recessed into the home's wall if that is the preference of the owner. The advantages to having an electric fireplace installed are numerous. No costly gas lines or hard to store firewood are needed for these types of additions. Simply plugging them into an appropriate outlet offers your family the cozy fireplace they've been hoping for. Another advantage is the fact that many electric fireplaces are built into furniture quality mantels or entertainment centers. As such they are a great choice for renters, as they can be taken with them when moving out. Possibly the biggest advantage to an electric fireplace is their relatively low cost. 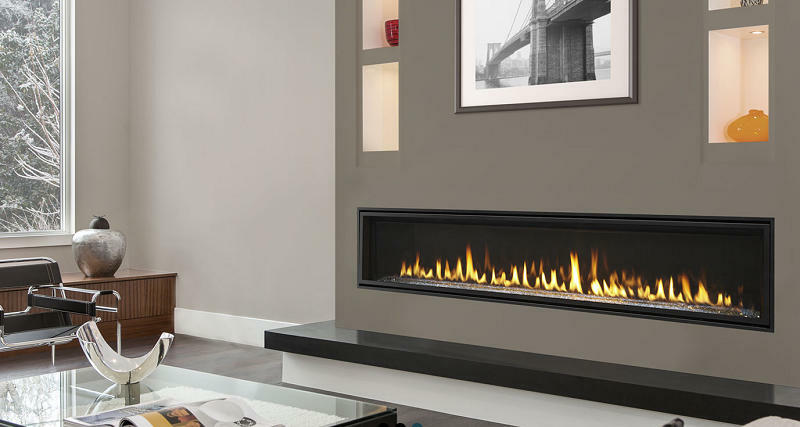 Ethanol fireplaces are one of the most convenient fireplace options. This type is often includes models that are small and portable. This allows homeowners or renters to carry them from room to room allowing for use wherever they want. With these fireplaces, the ethanol itself is the biggest disadvantage. This fuel often burns rapidly which means burn times are shorter in between refills. 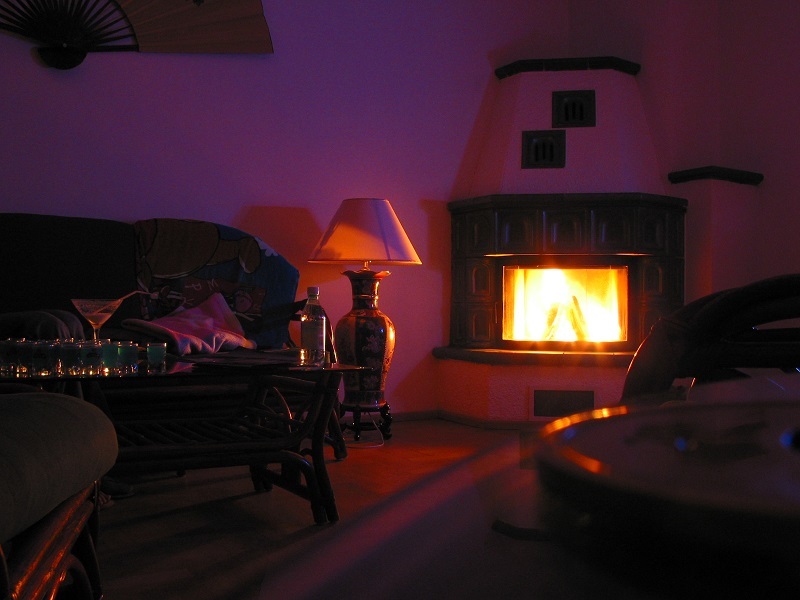 This can often be troublesome if you want to light the fireplace and enjoy a party. They are also strictly designed for ambiance and not intended for zone heating, ruling them out for some applications. There are two primary vent options when choosing a fuel-burning fireplace, as electric fireplaces need no vent. All wood burning fireplaces are vented, and gas fireplaces can either be vented or vent free. Vented gas fireplace options include direct vent or b-vent, though b-vent fireplaces are becoming scarce and limited in options. 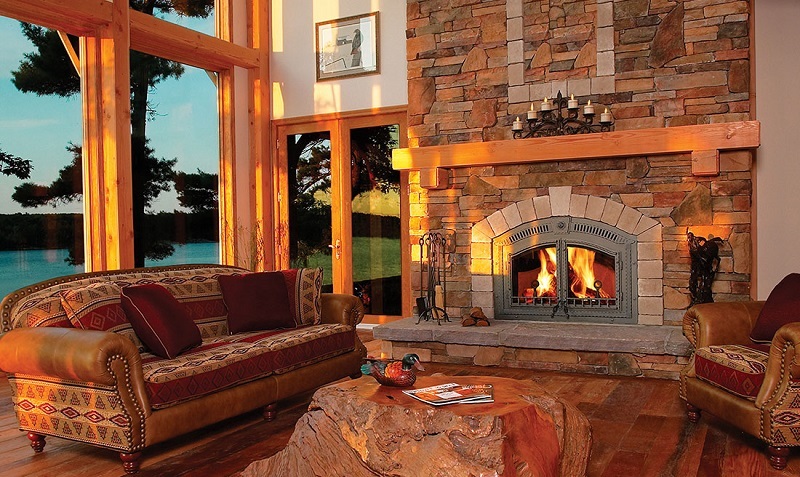 Open Wood Burning Fireplaces — These are like the traditional masonry fireplaces. These fireplaces are open to the room, burn wood, and require a chimney. Due to the heat lost up the chimney, these fireplaces aren't used to heat the home. They are usually used more for the visual appeal. B-vent Fireplaces — These are gas fireplaces that resemble the wood burning type. They are open to the room and require a chimney. These are very similar to wood-burning fireplaces in the fact that they lose most of their heat up the chimney and are most commonly used for their appearance and appeal. Direct Vent Fireplaces — These are the gas fireplaces that produce the most heat and most closely resemble the traditional type of fireplaces. They are not open to the room and thus do not use interior air for combustion. These units use ceramic or tempered glass panes to separate the fire from the room itself and utilize a piping system is used to bring in combustion air and remove the waste gas produced. Vent Free Fireplaces — Due to the extreme efficiency of the burn in vent free units, these fireplaces do not require a chimney or vent system. This allows for all of the heat produced by the fireplace to stay inside the home but also brings some risk. Be aware that due to the lack of venting, all the exhaust goes back into the living space of the home. To some, this is a nuisance due to the bothersome smell of burning gas. Others may be concerned about the safety of those exposed to the combustion by-products in the home. This is a concern shared by many, and as a result, there are areas where vent-free appliances are illegal. Be certain to check your local codes to be sure that a vent-free appliance is legal before you finalize your purchase of such a unit. Notes on air consumption and tightly insulated homes — It is a well-known fact that new homes in both the US and Canada are focused on efficiency. The development and now widespread use of home wraps, closed cell foam, high-efficiency windows, and other technologies is creating a new generation of homes with minimal heat loss/gain and very little air changeover. This creates a unique set of challenges for any vented open front fireplace and vent free gas fireplace. Vented open front fireplaces (open wood burning and B-vent) fireplaces effectively act as vacuum pumps when they are being used. The force of natural draft caused by the fire burning pulls air from the building envelope very effectively. In older homes, makeup air was readily pulled in through gaps in the building envelope and small air leaks around recessed lighting, attic doors, etc. With newer homes, this ready source of makeup air is eliminated, meaning that if burned long enough, the fireplace flue itself can reverse its flow, pulling smoke and flue gases back into the home to relieve the vacuum. The solution to this is to install a dedicated combustion air kit with the fireplace. Most manufacturers offer one, and they are designed only to remain open when the fireplace is in use. This provides a direct source of makeup air for the fireplace and eliminates the vacuum issue. Vent free gas fireplaces face a uniquely different issue. They do not remove air from the building envelope, but they do utilize oxygen as they burn. For very tight homes with smaller floor areas, it is possible for a vent free gas fireplace to utilize a large enough quantity of oxygen to cause the unit to shut down. Vent free units use what is known as an ODS or oxygen depletion sensor. When oxygen levels reach around 18% (normal is 22%), the system will cause the fireplace to shut down. While this is rarely experienced in larger homes, even tightly insulated ones, it is certainly possible to experience the issue in smaller homes. Because outside air contains dust, mold, and other contaminants that can be introduced into the home through consumption by the fireplace, vent free models do not offer outside air kits. As such, it is important to take into account how well insulated your home is and how large of an area is available for the vent free unit to pull oxygen from. 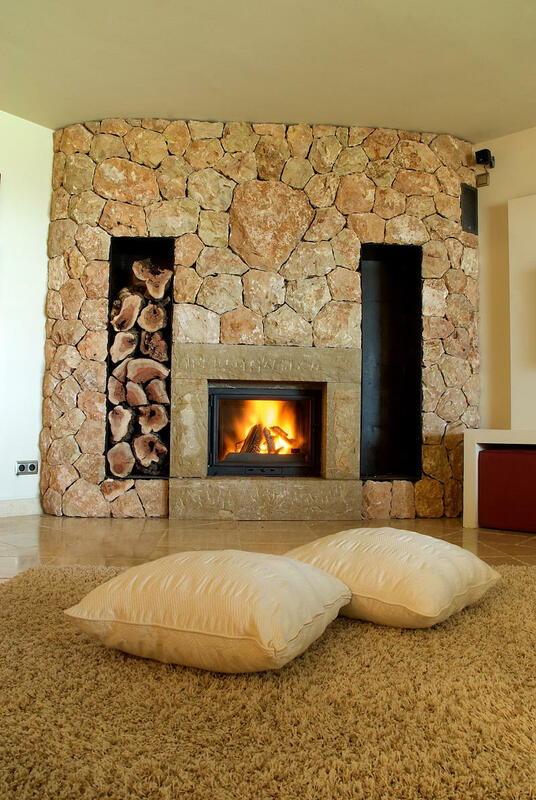 Often when adding a fireplace to the home, consumers have difficulty understanding the difference between a prefabricated fireplace and a masonry fireplace. Most that are sold have a fabricated chassis that permits installation into a framed enclosure that is constructed of dimensional lumber. Wood burning fireplaces are a prefabricated model that is designed to burn wood as the primary fuel type. There are three types of wood burning fireplace. Indoor Open Wood Burning Fireplaces: This is a fireplace that is completely open to the room by design. They will come with mesh pull screens as standard to prevent embers escaping to the room and almost all of them have glass door options. These fireplaces are tested and listed as "decorative," meaning they will provide radiant heat to the room, but they should not be relied upon as a supplemental heat source. They pull a large amount of air from the room as they burn. Installing the special accessory glass doors will slow the process, but air is still pulled. These types of fireplaces usually have knockouts on the left, right, or both sides that will allow the installation of a gas log lighter to ease fire starting or for routing a gas line for a gas log set. 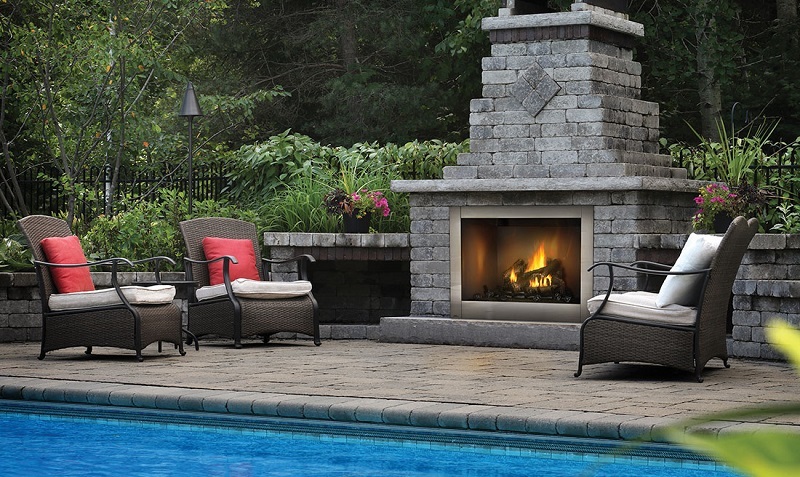 Most models are listed to accept both vented and ventless gas log sets. Even if using ventless gas logs, the fireplace and chimney system need to be installed and utilized just as if the fireplace was used for burning wood. These systems usually utilize a proprietary air-cooled chimney system for venting. Open wood burning fireplaces are capable of generating over 100,000 BTUs, but only a small percentage of this output is available for heating, due to the previously mentioned tendency of the unit to pull combustion and dilution air from the room. Most manufacturers will place no BTU rating on these models for that reason. Regulations against open fireplaces are tightening, with many areas no longer allowing new installs. Legislation has been passed that requires sealed doors to be installed on masonry fireplaces in most areas. Although this legislation does not include manufactured models, it is not uncommon to have local municipalities misinterpret this code. Indoor High-Efficiency Wood Burning Fireplaces: These types of fireplaces differ from open fireplace in the fact that they are designed to burn with their doors closed, and they are intended as supplemental heaters. They are essentially a built-in wood stove. They take the design of a modern wood stove (firebrick liners, insulation, heavy steel chassis, air controls, etc.) and add an additional outer chassis that allows them to be safely built into a combustible wall. These models use much less oxygen from the home and offer much more supplemental heat. They will sometimes offer heat ducting systems that allow the customer to duct heat from the unit into an adjacent room or into a furnace plenum to supplement the output of the gas furnace. One important and not well-understood difference in this category is "high efficiency" vs. "EPA certified" appliances. "High efficiency" models are closed combustion wood fireplaces that are built like a stove and offer greater heat output, BUT they were not able to meet the current EPA guidelines, and as such, they are not fitted with air controls to regulate the rate of burn. "EPA certified" models meet current EPA guidelines for stoves and are fitted with air controls. They are cleaner burning, usually have a smaller firebox (to ensure a hot and clean fire), and allow the customer to regulate how large of a fire they want. All of these systems utilize a solid pack chimney system (same as a wood stove), due to the fact that they are a hotter burning appliance. Also, these systems can be utilized as a true heater and are rated as such. They are usually several times the cost of an open wood burning system because of the engineering, testing, and listing that goes into them, but they can last for decades if properly cared for. Because they function like a stove, these models have a controlled, slower burning fire that creates a good deal of usable heat. The output may range between 40K and 100K BTUs, lower than the average open wood burning model, but more effective heaters nonetheless. "High efficiency" models fall under the same restrictions as an open fireplace and do not have air controls. Because of this, they may not be allowed in all areas. EPA models are less strictly judged and are accepted in almost all areas because of their very clean burn. EPA models can be regulated, and large models can heat up to 3,000 square feet with sufficient air circulation. 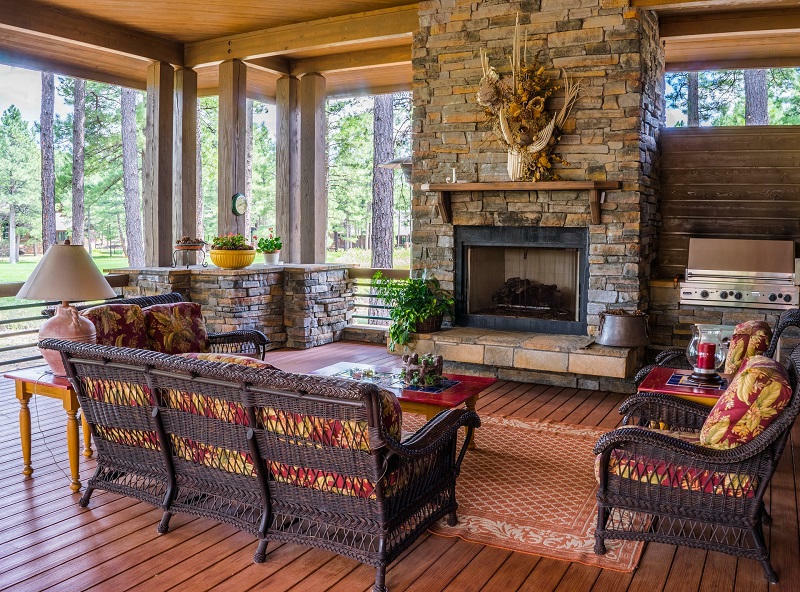 Outdoor Open fireplaces: This class of wood burning fireplace is specifically tested and listed for use outdoors, whether it be out in the open, under a pavilion or arbor, or under a covered porch. 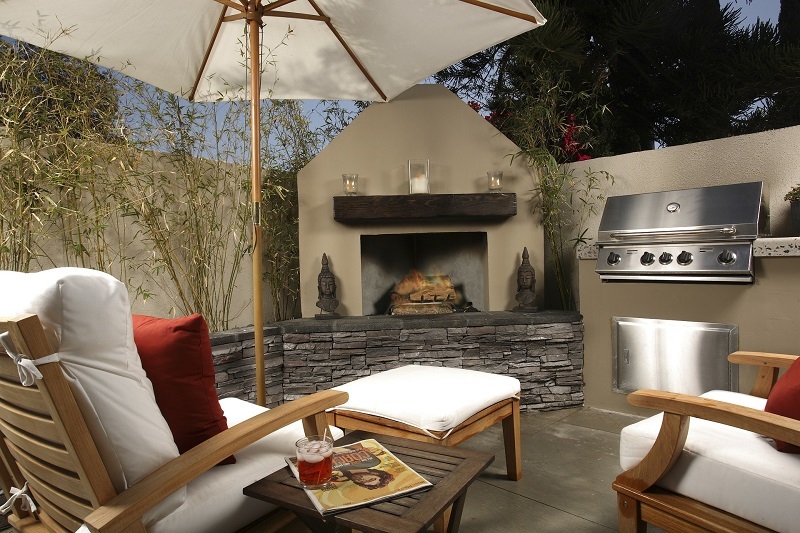 Anywhere outdoor air will come into direct contact with the appliance, this type of fireplace should be installed. The design of both the fireplace, the associated features, and the type of chimney used is the same as an indoor open model. The one difference is that the fireplace chassis and screens are manufactured from stainless steel in place of the galvanized steel used on indoor models. In fact, some manufacturers change nothing else between the indoor and outdoor models — only the material changes for the new outdoor series. The stainless steel is usually 304 grade and will allow the unit to last for decades in an outdoor environment. As with their indoor equivalents, many areas have placed strict regulations on the installation of an open outdoor model of fireplace. The smoke generated can be seen as a nuisance to neighbors and can negatively affect air quality. As such, it is important to check local codes before installing this type of unit. This type of fireplace is designed to burn natural or propane gas only and cannot be used to burn wood. Unlike wood-burning fireplaces that have the option to accept gas logs, these models have their burners designed as an integral component and do not have the provision or insulation to be backward compatible to a wood burning installation. There are several varieties of gas burning fireplace: direct vent, b-vent, or vent free. Direct Vent: These models are vented using what is known as a co-axial vent system, which is a small pipe within a larger pipe. The small pipe vents exhaust gases to the outdoors, while the outer larger pipe pulls in oxygen for combustion. The outer pipe also acts as an insulator to keep the temperature of the vent system lower. The fireplace does not use any combustion air from the room and is sealed by a solid pane of tempered or ceramic glass across the fireplace opening. Direct vent fireplaces will include a barrier screen that overlays the glass to prevent burns via accidental contact. The screen can be removed if desired. These fireplaces are very versatile when it comes to installation and venting. They are usually accepted for all applications and don't have bedroom limitations. The venting system can usually be routed and terminated either vertically or horizontally. Direct vent models are manufactured in small units that generate as little as 5,000 BTUs, up to very large models that generate 60,000 BTUs or more. Their design is efficient, and use of ceramic glass and circulating fans sees some models exceeding 85% thermal efficiency. It is important to note that all efficiency ratings are not equal. Two commonly seen efficiency ratings are AFUE and thermal efficiency. AFUE stands for Annual Fuel Utilization Efficiency, and the percentage is a direct reflection of how many BTUs are available from the initial input for heating. B-vent: This fireplace can be directly compared to the operation of an open wood burning fireplace and is the closest in look to an open wood burner. It effectively takes an open wood burning fireplace and modifies the design to include an integral gas burner and valve system, though it still uses pull screens for appearance. However, instead of an air-cooled chimney system, B-vent models use what is known as B-vent or natural vent piping, which is a double walled aluminum/galvanized venting system. Like open wood burning fireplaces, these systems are listed strictly as decorative models and offer no real heating ability. They are perfect for warmer climates that are looking for appearance without the heat. These systems are not as prevalent as they once were due to the recent focus on home efficiency and heat retention. Because B-vent models are so similar to an open wood burning fireplace, they will also have the same "decorative only" heating capabilities. Some models generate up to 40k BTUs, but almost all of the heat is lost to the vent. Only direct radiant heat is available. Vent Free: Like B-vent fireplaces, these systems are usually open to the room, although some models do feature a decorative glass pane in front of their opening. The systems have no venting system. Instead, they utilize a highly engineered gas burner and purpose-built log set that allows them to effectively and cleanly burn their fuel gas, releasing only heat, carbon dioxide, and water vapor into the room. The systems are limited to a maximum of 40K BTUs of output to limit oxygen depletion as they burn. These systems are very popular due to their simple installation, but they do have limitations. Canada, some US states, and various municipalities do not allow their installation, and they have special BTU caps for installation in bedrooms and bathrooms. Lastly, they must be serviced yearly, as build-up of dust or other debris in the system can lead to foul odors, the release of carbon monoxide, and other unwanted operation. As previously mentioned, vent free systems are limited to a 40K BTU maximum for indoor applications. Because they have no vent, they are classified as almost perfectly efficient, with only minimal loses to the chassis of the fireplace itself. That being said, they do have their limitations and cannot be used as a primary heat source. As a supplemental heat source, they can do well, especially in large open area where the moisture they create can dissipate. Other notes pertaining to gas burning fireplaces: While almost every B-vent model on the market is a "traditional" style (relatively square opening, screens, and a log set), direct vent and vent-free versions have diverged into two distinct categories. On one end is the aforementioned traditional models, featuring a slightly rectangular or square opening that lends itself toward the look of a classic wood burning fireplace and features gas logs. On the other end are linear models that lean towards the contemporary, using a low and wide opening and featuring fire glass, fire art, or other alternative media. The term "linear" also specifically refers to the ribbon of flame that is created by a very shallow and wide burner. In between these two extremes are some crossover models. Models like the Superior DRC2000 series feature classic dimensions, but trade fire logs for glass media. Models like the Empire Boulevard linear fireplaces also offer log sets to bring them back from modern extremes. In summary, the customer does have a wide array of options to bring them to whatever design end they are looking for. These fireplaces are effectively a space heater that adds a decorative faux log set, lighting system, and decorative accents. Electric fireplaces have a well insulated outer metal chassis that stays relatively cool to the touch, eliminating the burn risk of other fuel types. Electric fireplace technology has improved so much in recent years that sales of electric fireplaces have taken off, due to the much more realistic depiction of authentic flames. Many electric models offer the customer the ability to turn the heater off if only the look of the flames is desired. Other models are offered without a heater if the customer desires. Because of their low-temperature chassis, many manufacturers offer flexible installations as well, meaning the same fireplace may be installed into a combustible wall enclosure or as an insert into an existing fireplace by adding an optional surround. The only real drawback to electric models is their energy consumption and their need for a relatively unshared circuit. Most models utilize a 120-volt circuit, and their amp draw is significant, meaning the circuit cannot be used for other high amp items for risk of overloading. Some models do offer a 240-volt connection, which lowers overall amp draw, but means that a dedicated 240-volt circuit would need to be run. This can be costly. Thankfully, most electric models are very cost effective when compared to their gas and wood burning counterparts, as they require no venting and don't cost as much to produce. These models are similar to electric fireplaces in their intention to introduce a fireplace into a home at a low cost. Instead of an electric heating grid, these ethanol models use either a fuel tray or fuel cans filled with liquid ethanol fuel, which is derived from corn, sugarcane, and other crops. The fuel tray rests in the base of the fireplace and can be lit easily with a long lighter. The trays can be allowed to burn until fuel is exhausted or can be quenched with an included tool or slider built into the fuel tray. These units are very simple, requiring no power or venting. Most models are designed to hang on a wall, but there are free standing versions. They do create an authentic flame, but the biofuel trays are small, meaning they are primarily for appearance and not rated as room heaters. When having a fireplace shipped to your home, it's important to remember that smaller units such as ethanol and electric types, and small gas units will be shipped to your home via parcel. Due to their size, most other models will be shipped via freight carrier and will arrive on a pallet. For orders containing both a fireplace and vent pipe, the components will usually be shipped on their respective pallets and should be inspected thoroughly before taking delivery. It is important to fully inspect the shipment for damages once it arrives. The information in this article is a great place to start choosing the best fireplace for your home. Using these criteria will help you make an informed decision, pick the model that is most suitable for your family, and start enjoying the beauty and comfort of your very own fireplace. With proper care and a structured maintenance schedule, your new fireplace can provide many years of lasting enjoyment. Ethanol fireplaces are by far the simplest to care for and only require the occasional wipe down with a damp cloth. It is recommended to clean the ethanol tray after every 3 to 4 burns. Electric fireplaces are also low maintenance, but it is recommended to complete a seasonal inspection of the power cord and chassis to ensure that nothing is out of sorts. Air intakes should also be vacuumed to remove dust that collect during operation. If the manufacturer provides oiling instructions for moving parts, machine oil should be applied as directed. Gas burning direct vent models also require an annual inspection. Direct vent fireplaces should have the glass front removed and cleaned as necessary to maintain optimal viewing. Any dust or spiderwebs should be vacuumed from both the fireplace interior and the lower compartment containing the gas valve and other components. Verify the logs are still in the proper position and have not shifted. Lastly, the pilot assembly should be blown clean with a jet of compressed air. B-vent and vent free gas fireplaces tend to collect more dust than direct vent models, due to the fact that they are open to the room. The interior and valve compartment of these models should be vacuumed to remove dust, spider webs, and dander. Verify log placement is correct, especially for vent free models. Lastly, the pilot assembly should be inspected and cleaned. Wood burning models will require the most frequent service. Open wood burning models require regular ash removal and care should be taken not to overfire the unit when in use. It is also necessary to clean any installed glass doors as needed to maintain fire viewing. The chimney system should also be inspected at least twice during the burn season. Once before initial use and again during the season. Any inspection that reveals build up of creosote necessitates a chimney sweeping. By following these care guidelines, your investment will be long lasting and provide maximum value and enjoyment.